Having spent the past six months putting on as much weight as possible, local bears are prepared to snooze for the next six months. Through some remarkable feat of metabolism, adult bears will not eat, drink, or eliminate bodily waste for almost half a year. Instead they consume stored fat and emerge in the spring 25% lighter. It is not well understood how, but bears are able to recycle the by-products of metabolized fat into usable source of food energy. A human trying to do this would die of toxic shock in about a week. Also, they do not loose bone mass, a serious concern for humans who are inactive for health reasons. In these respects, bears are better suited to long distance space travel than we are!. 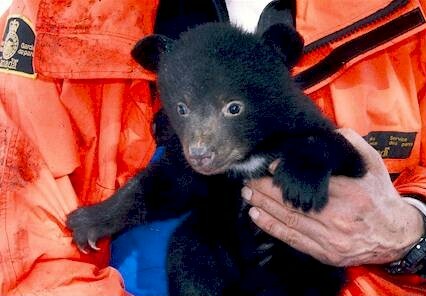 Even more amazing, female bears give birth during hibernation. Born in February, cubs weigh about 500 grams (imagine a pound of butter) and are on their own to find a teat to suckle while the sow sleeps. Stored fat is crucial to nursing a litter of two or three cubs, who will weigh between four and eight kilograms by the time they leave the den in May. Bears are not true hibernators. More accurately, they are dormant in winter. They maintain a near normal body temperature, unlike ground squirrels which allow their body temperature to drop to near freezing temperatures. The advantage of a high body temperature is that bears can be aroused from their sleep if attacked in their den. During autumn, grizzly bears dig for ground squirrels, taking advantage of their dormant condition. However, maintaining a high body temperature costs many calories over a winter. Bears are able to survive this great fast because they can eat so much during the summer. This also why bears are attracted to prime sources of food and can be aggressive towards possible competitors. This year, bears in the Columbia Mountains enjoyed a good berry crop, unlike the bears in the Rocky Mountains of southeastern British Columbia where a dry summer withered this year’s crop. Natural food sources vary year to year and place to place which is why bears need large areas in which to live. Much like human teenagers, younger male bears enter the den later than other bears, seemingly reluctant to go to sleep. Increasing snow during the fall at higher elevations prompts them to seek food in the valleys, where encountering human foods and garbage is likely. This is when bears get into trouble. It’s always tragic to hear of a bear shot with his head in a garbage can. It is especially important in late fall to keep garbage in a place inaccessible to bears. Keeping bears from learning about tasty human food is the most effective thing we can do to increase the chances that bears will make it to their den for another remarkable rest.